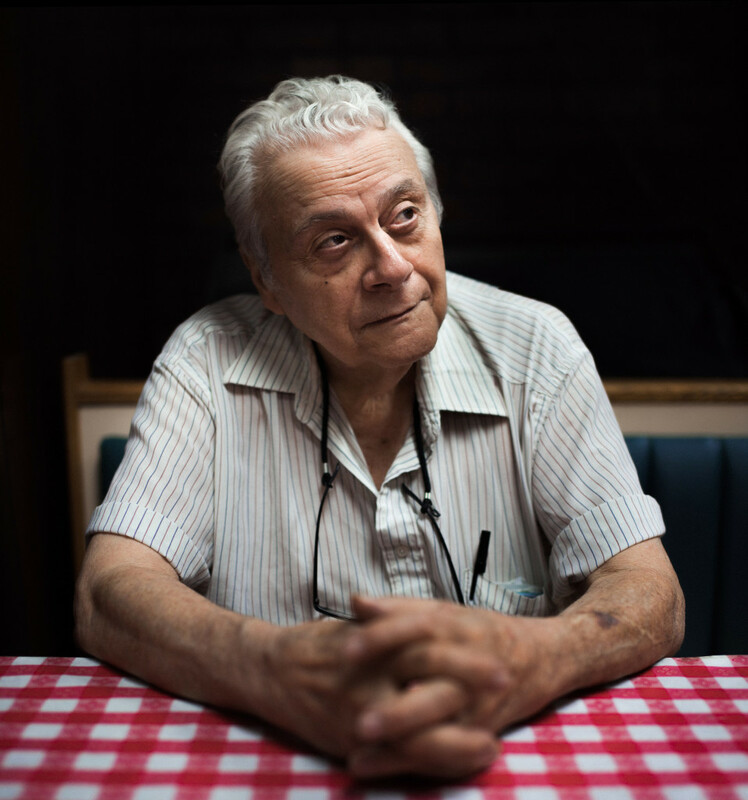 If anyone has seen Bridgeport change over the years, it is John Veliotis, who’s been selling hot dogs in the neighborhood since he was twelve years old. 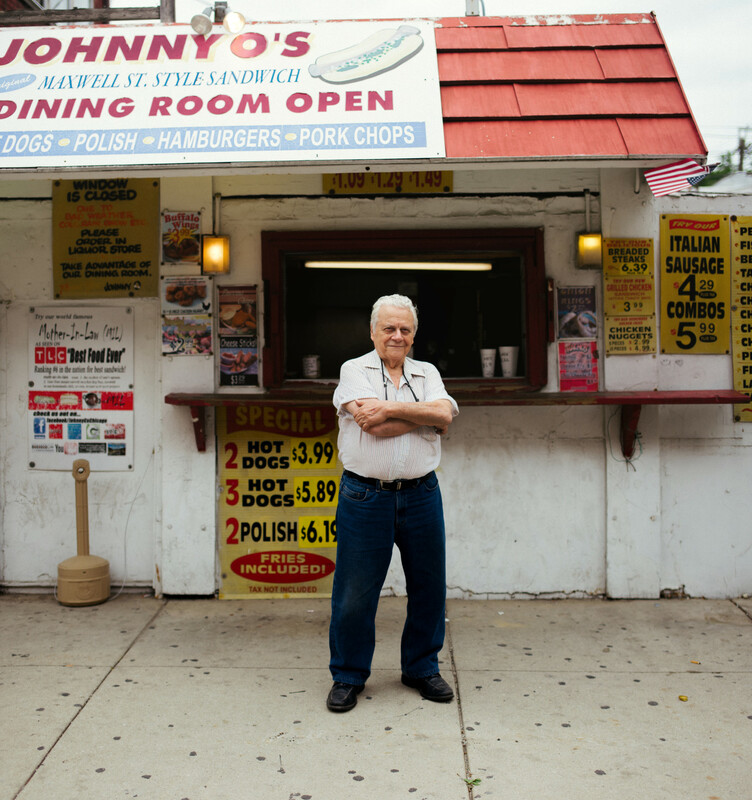 It is only in recent years that Johnny O’s, his hot dog stand and liquor store at 35th and Morgan, has attracted attention from outside of the neighborhood, popping up in TLC’s Best Food Ever and New York Magazine’s food blog. As Johnny O has watched his customers shift from blue-collar factory workers to artists and college students, his food has stayed the same. It still satisfies people in the neighborhood and out-of-towners twenty-four hours a day. Scene: the dining room of Johnny O’s. You had your own hot dog cart at twelve years old. Well, actually, it was my mother and father. And they had a location out in front of Spiegel’s, which was heavily populated with employees at that time. There must have been three thousand people working. So, as a young lad, I learned how to get out on the streets and earn a living. As I got older, maybe when I was fifteen or sixteen, I got two locations on my own. Pushcarts. We had a spot at the White Sox Park also. We used to push the cart down there, and then we got high tech. I bought a little trailer, I used to hook it onto my car, and we took it out to the White Sox Park at that time and made a living doing it that way. That’s the way we made a living. It’s the only way I know how to make a living. Selling hot dogs. We opened on 31st and Poplar in 1959. It was a little shack that originally was a hot dog stand, and the lady, for some reason or another, didn’t want to run it anymore. We put a little money into it, it was just an old beat-out shack, and developed Johnny O’s Famous Beef Stand. That was the original name, and we used to cook our own beef. It was excellent. Matter of fact, I go to Portillo’s, and our beef was similar to theirs, if not better. We were there ‘til 1969, and I decided—another long story—I tried to buy the property there. Nice gentleman who owned it said, “Johnny O, if I ever sell the property, it’ll be to you.” Well, I didn’t want to wait anymore. So I sold that business to a couple of young Greek guys, and I moved to Arizona. I went to Phoenix, Arizona. I was there approximately two years, and in the meanwhile I was flying back and forth from Phoenix, my mother was very sick, and eventually passed away. I always liked the corner of 35th and Morgan, so I negotiated to buy that corner, and I brought my family back to Chicago. We have strong, strong ties to Bridgeport, going back to when I was a kid. There was chemical plants here, and meat companies, and Spiegel’s, and Western Trucking, and Wilson Trucking, Wrigley Spearmint Gum. Schulze Baking Company. From 35th and Morgan going south into the old stockyards, it was nothing but small companies, big companies, you name it. I had organized a semi-pro football team. We’d play out of the city, and we had a friend of mine, his name was Lefty Mackolonis. Lefty made a song up, and we used to come back from playing ball. He had a melody to it, but I forget how it went, but the words were: “You may lose your arms, you may lose your legs, you may lose your eyes, but as long as you got your nose, you know you’re back in Bridgeport.” That was because of the smell from the stockyards, the chemical companies, and then all of the sudden you’d get a nice, fresh smell from the bakery. That’s what all of our people in Bridgeport had to live with. And then you had the Bubbly Creek, which is the South Branch of the Chicago River, which was a dumping ground for many, many, many years, for the stockyards and the chemical companies. What’s really ironic is they built million-dollar homes, the Bridgeport Village, right along the old Bubbly Creek. We thought they were crazy. But they did clean up the river, and people bought the homes. We have the Zhou Brothers Art Center, which draws thousands of people here every month. And the Bridgeport Art Center, at 35th and Racine, which draws thousands of people every month. And both of those properties, at one time, belonged to Spiegel’s. There’s a lot happening in the area. We’re very enthused about it, being a businessperson here in the neighborhood. The more people that come in, the better it is for us. Matter fact, we’ve been wanting to expand here for years, and for whatever reasons—maybe we couldn’t get the money, the banking industry wasn’t giving out any money at the time, different reasons—but we’ve been wanting to expand here for many years. And maybe, if things go right, we are definitely going to expand Johnny O’s. You also had a side career as a singer. We used to go to a local lounge in the neighborhood—it was a bowling alley, but they had a lounge in it. Right at 35th and Halsted, just west of Halsted. Where the kidney transplant place is. That was a huge building there. We were actually underage at the time, but they used to serve us. But we were always gentlemen. Tough kids, but gentlemen, and they liked us. They had some great singers on the jukebox: Tony Bennett, Al Martino, Vic Damone. I just liked to sing, and started singing from there, and a couple older guys said, “You know what, Johnny? We’d like to back you up as agents.” I said, “Get outta here,” I was a tough kid. I was nineteen, twenty. Going on twenty-one. I didn’t follow through with those guys, but when I got drafted in the service—since I did sing at a couple local clubs, amateur night, and one lounge called Town Casino, downtown—one of our friends was a singer there, and she got me in there for maybe about five or six weekends to sing there. I got drafted in the army, so they said, “Tell ‘em you’re a singer, you might get in the Special Service.” So, I put on there that I sang, and I had a couple clippings. And sure enough, I got into the Special Service as a singer. They thought I was some big star, from Chicago. I got a real big kick out of it. When I got out of the Service, a couple of the guys that I was in the Special Service with, they were from Chicago. They formed a band, and called me up and we used to do all the local clubs in Chicago, down on Rush Street. I did some appearances—the Waldorf Astoria room at the Hilton, some other places I forget the name of. But I really didn’t follow through on that like I should’ve. Married, got kids. Show business life is high-flying. A lot of distractions. I had to make a living. It does have its ups and downs. It’s not an easy buck. You’ve got problems with help, and the cost of operation. There’s a lot of negative things, but in the long run, we’re hoping it’s gonna pay off for my sons. I just want to make sure I’ve laid the groundwork for them. Hopefully we can go ahead and expand like we’ve wanted to and look at the end of the rainbow. All those years of hard work and commitments and many hours of ups and downs. We’ve seen the bad times and the good times. There was an incident a couple years ago outside, in which someone got shot. It could’ve happened anywhere. Fortunately, we had our security cameras going. It was a nice summer morning, there were maybe ten or fifteen customers out there. Everybody was laughing, having a good time. This young man forced his way into the window. There was a young man there already, ordering food. The guy that butted his way in there was looking for a problem. He told the other guy, “You got your hat on wrong.” The other guy said, “Look, I don’t want no trouble, I’m just ordering food.” There was another young man who was involved, Buddha, who I’ve known since he was a young lad, he originally belonged to the gangs over here. He was a friend of the young man who was instigating the problem. He told him, “Look. These guys don’t want any trouble. They’re trying to order food. Leave them alone.” But the young man insisted that the other guy put his hat the right way. As they walked away, we heard shots. I wasn’t there, but you can hear it all on the recording. The young man got shot. Shot him right in the head. And poor Buddha, who was trying to break things up, he got four or five shots in him and he’s paralyzed for life. For nothing. As it turned out, through our surveillance camera, they had pictures of the guys. We didn’t know it from the time, but they lived across the street in the condos. A lady that lived there saw the two guys, and she called the police and told them who they were. They took about eight or nine months to find one guy, and another guy turned himself in. I’m proud of what I did, because we happened to know the leaders of the gangs that are here. The Morgan Street gang thought it was the gang from the projects that did the shooting. Anyhow, we brought the main guys over here and showed them the film, exactly what happened. They saw that he instigated it, and the guy that he started the trouble with was not from over there. He was an outsider. We prevented a war between them and the guys from the projects. The alderman and the commander thanked me very much for interceding and stopping this before it got out of hand. I know the gang members’ grandfathers, and their uncles. They played ball. Over the years, we’ve become friends. So, we’ve never had any disrespect, except for a couple minor incidents. We find it to our advantage, of course. We’ve always been good to everybody. We try to maintain respectability on both ends, and we expect it. He laughs. Well, you’re not gonna believe this: hot dogs are number one on my list. All our food is good. We use quality food, the beef is good. I don’t make it anymore, like we used to, but once we expand our kitchen, if things go right, I’d like to start cooking our beef again like we did in the past: right on top of the stove, braised, loaded up with garlic powder and oregano and chopped onions. It was great. There’s been a lot of recent attention on your mother-in-law sandwich. It’s great. What made ours different was, it was a popular thing for years on the South Side, the mother-in-law. Most of the places used to just put a tamale on a bun with a little bit of chili, but what made ours different was, we put the kitchen sink on it. Mustard, relish, onions, tomatoes, the whole works. That’s what made ours different. What happened was, a gentleman from the Chicago Tribune, if I’m not mistaken, food section was in the neighborhood, checking out the hot dog joints and the restaurants. Somebody said, “Why don’t you go to Johnny O’s?” So he came over, and he was impressed with the way we made the mother-in-law. He gave us a big write-up in the food section. From there, it escalated. I don’t know how that works, but it got on the Internet. One day, I was sitting over here, and it was raining cats and dogs, and my son Peter said, “A young lady wants to talk to you.” I asked if she’s looking for a job. She comes walking up the steps soaking wet. She said as she’s coming up the stairs, “I saw you on the Internet with your mother-in-law.” I said, “What the hell’s she talking about—oh, yeah, yeah yeah, the mother-in-law.” She had driven in from the state of Washington, stopping at little cities and towns looking for unique food menus. She was working her way to Chicago, and she was going to continue out to the East Coast by herself. I don’t know if she worked for somebody, or how she was doing this. She sat down, and I asked if she was hungry. She said yeah. She had a hot dog, a beef sandwich, and the mother-in-law. And a big fountain soda. Shortly after that, we get a call. My son Peter, he said, “Some guys from New York, they want to come here to film our business in regards to the mother-in-law.” I said, “What’s it gonna cost us?” He said, “Nothing, Dad.” I said, “Get outta here, there’s some kinda catch to this. Tell him to call us back.” A week later, they called back. They came in with eight guys, filming us make the mother-in-law. That was for Best Food Ever. We were in the top ten, number six. We were really impressed. The best one was, I was in the hot dog stand one day, and this lady was ordering a mother-in-law. I asked, “Did you see us on the Food Channel?” She said, “Yeah.” I asked if they’d like to sit down. They were from Australia. Can you imagine that? They saw us on the Internet in Australia. That was the best one. A writer for USA Today recently called Ricobene’s breaded steak the best sandwich in the country. Get outta here! USA Today? Not according to Corey McPherrin, from channel 32. He loves our breaded steak. We’ve had their breaded steaks, and we’re disappointed. We’ve had theirs, we’ve had Freddie’s, we had Tommy Ferro’s. Ours is better than theirs, I hate to say it. Tell USA Today to try our breaded steak! Ricobene’s is like rubber next to ours, I’m telling you. Johnny’O is not only an icon in the neighborhood but a great and generous guy as well. What a great article. I live down the street from Johnny O’s and frequent there often. They are the nicest people in B-port and run a great business. Glad to see they’re getting some well deserved recognition.